If you are planning a 1-2 week trip to see the highlights of South China, cycling around Guilin is definitely your best choice. Both Guizhou and Guangxi have stunning Karst mountain scenery, yet Guilin features the most outstanding one. Guilin is a small-sized city of China. It takes only about one hour to cycle from the south entry (the national road of (G321) to the north entry (G322). The key exit to the western part is on the road to the Guilin Liangjiang International airport, where riders will find turnings to the northwest for Longsheng terrace field, etc. Generally local bicycle fans choose the way out from the Guilin University of Electronic Technology (same direction of Yaoshan Mountain) for the eastern routes. In this way, they can do some country roads biking to the northeast, or go further to Zujiang/Mopanshan pier for journeys to the southeastern parts of Guilin and reach Daxu, Gongcheng, etc. 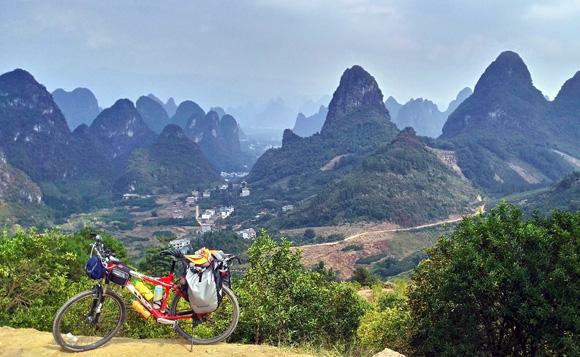 You are discouraged to bike through the national road of G321 (connects Longsheng, Guilin and Yangshuo) or G322 (between Guilin and Xing’an) or some popular provincial roads. As you'll probably encounter the annoying traffic congestion, with much vehicle exhaust and road accidents, as well as the poor sceneries! We are always joking that every time when we biking out, the road is on rebuilding and one breaks when the other is completed. However, there are still many less travelled routes hidden around grand Guilin, with which cyclists will get much closer to the tranquil nature and keep far from the madding crowd. The relatively isolated trails lead to the primitive, less popular destinations (e.g. 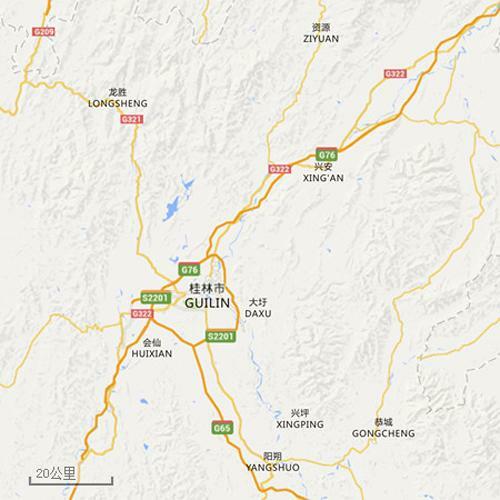 the Luojing town and Golden Peasant River Reservoir) that are out of favor by common tourist groups. However, you may expect roughly paved country roads, dirty muddy roads, macadam paths, farm tracks, broken cement roads/ asphalt roads, apart from perfect conditioned roads and expressway. It is very risky to cycle into Guilin’s mountainous areas without a local guide, as you will probably find dozens of turnings and get lost easily. When biking uphill for a long distance or on the roughly paved paths between pristine villages, you’ll meet tough challenges that only well-trained riders with proper bikes are able to complete. Although we haven’t listed these routes into the catalog, you are welcomed to enquiry and take the adventures accompanied by our guides individually.